Newbie tagger When you create an account, you become a newbie tagger. Newbie taggers can create new content, and only edit their own content. If newbie taggers wish to edit an existing entry, not created by themselves, they may ask to become a confirmed tagger. Confirmed tagger can revert revisions, delete content, edit any content, and publish comments submitted to publication. To parse submitted comments and publish it for confirmed taggers, go to shortcut, validate/edit comments. Software entries (not datasets or training materials) will be classified into 3 main tiers relating to its degree of completeness. 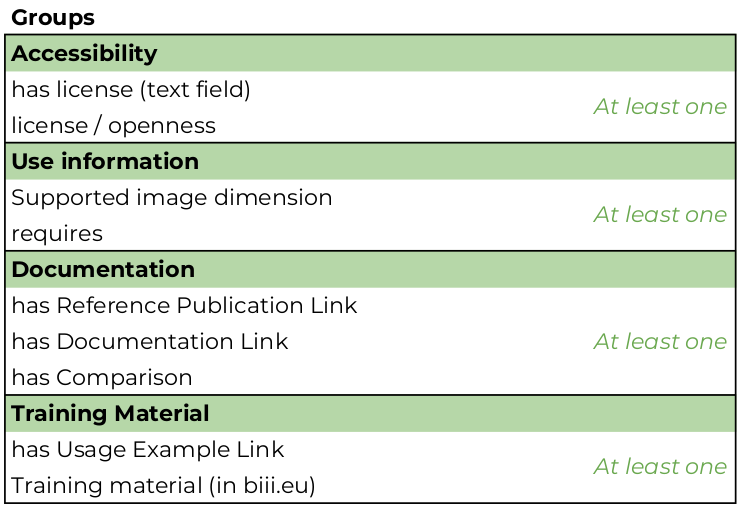 The standard described here (still under discussion) provides guidelines to support BIII.eu webtool curators to monitor the webtool content and tagging. This standard was adapted from the Tool information standard documentation from ELIXIR bio.tools. Thanks to Jon Ison for referencing this documentation. This standard comprises a list of entry attributes to be specified for a software entry to be classified in a 5 tier rating of entry completeness and quality in BIII.eu. BIII.eu includes two ontologies on its framework: Bise core ontology and EDAM-Bioimaging. "SPARSE": Minimum information requirement for new entries. A SPARSE entry may be invisible in the webtool (and made it clear to the curator adding the entry in the UI) by default and will only show after aditional information is added (similar to what occurs in bio.tools). A sparse entry has a Name, Description, Unique ID (automatically created) and type (collection, component, worflow, don't know). This category may not conform to biii.eu curation guidelines and for curation purposes, such entries must be shown in the list of 'to be curated' of confirmed taggers somehow as 'high priority. "DETAILED": This is the mid-completeness category. An entry with 'Basic details' shall have implementation type (Library, plugin, standalone, and web application), Entry point (URL of the repository or 'official' website), an illustrative image (preferably a screenshot of the UI, or the input/output results, but logo whenever it fits), author ( in the form of LastName, FirstName (ORCID ID)) and at least one function (EDAM-Bioimaging Operation Class, for example, model-based segmentation or object feature extraction). In this category there must be at least one attribute from the Accesibility and Use information groups. In addition, the programming language of the tool is defined as well as its execution platform (Operating System). This category may not conform to biii.eu curation guidelines and for curation purposes, such entries must be shown in the list of 'to be curated' of confirmed taggers without any warning. "COMPREHENSIVE": Such entries would provide relevant information to users of all backgrounds and are useful resources and must include at least one attribute from the Documentation group, at least one Topic (EDAM-Bioimaging Topic Class, for example, fluorescence microscopy, Single molecule localization miroscopy and machine learning), one biological term (which is not a mandatory attribute, but highly recommended) and the DOI of its implementation. Since DOIs of implementations are still not common, this is also an optional attribute (See also: Making your code citable and DOI Registrations for software - DataCite Blog). 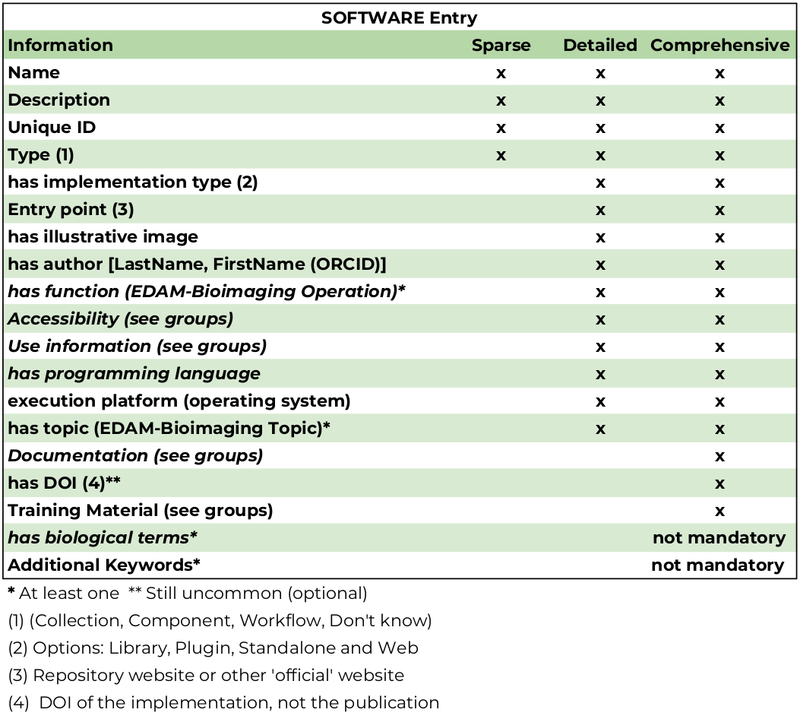 The additional entry attributes that make an entry comprehensive are Additional keywords (not covered by biological terms or EDAM-Bioimaging) and at at least one training material attribute and may have more than just one biological term, EDAM-Bioimaging Operations and Topics. This category conforms to biii.eu curation guidelines and for curation purposes, such entries must be shown in the list of 'to be curated' of confirmed taggers without any warning. BIII.eu is a web-based database that includes bioimage analysis tools, such as Software, Training material and Datasets. The guidelines presented here will help newbie taggers and confirmed taggers to add and curate software entries into BIII.eu. The software entry of the webtool include from simple components (e.g. gaussian filter), to image processing libraries, collections of components, and workflows (e.g. single particle tracking). The detailed description of the types of tools that can be included in BIII.eu webtool are still under discussion. However, we ask curators and taggers to include only tools that can be used (e.g we do not seek a publication without an implementation of the code publicly available. Commercial software can be accepted if specified as so) and relate to image analysis problems in biology (a.k.a bioimage analysis). The tools are described using two ontologies, BISE-core-ontology and EDAM-Bioimaging. BISE-core-ontology contains the structure of description of entries in BIII.eu, not only software, and includes entry properties such as author, reference publication, curator and so on. EDAM-Bioimaging is used as a source of terms to describe the entry with Bioimaging related vocabulary. In BISE, a software entry describes a bioimage analysis tool, which can be classified as a component, a collection or a workflow. A component is an implementation of certain image or data processing / analysis algorithms. Each component alone does not solve a Bioimage Analysis problem. These problems can be addressed by combining such components into workflows. On the other hand, a workflow is a set of components assembled in some specific order to process bioimages and estimate some numerical parameters relevant to the biological system under study. Workflows take image data as input and output either processed images or other type of data (usually numeric values). Workflows can be a combination of components from the same or different software packages. Finally, a collection is a software that encapsulates a set of bioimage components and/or workflows, e.g. libraries such as imglib2 and scikit-image or general purpose software such as Fiji, Icy. OBSERVATION: These curation guidelines were inspired by biotoolsDocs documentation. Part of it has been adapted or used as is from the original biotoolsDocs. Thanks to Jon Ison for referencing biotools documentation efforts. If you wish to suggest changes or additions to this documentation, please raise an issue to begin a discussion. How and what to curate? Try to fill as many fields as possible. If one field definition is unclear, report in the BIII.eu forum or raise an issue in Github bise documents repository. Also mind that there is an Entry Information Standard documentation for BISE, where you can check how your entry will be interpreted and curated by confirmed taggers. The entry information standard divides the entry based on its degree of completeness, from 'sparse' to 'comprehensive'. "MUST", "REQUIRED" or "SHALL" mean that the guideline is an absolute requirement of the specification. "MUST NOT" or "SHALL NOT" mean that the guideline is an absolute prohibition of the specification. "SHOULD" or "RECOMMENDED" mean that there may exist valid reasons in particular circumstances to ignore a particular guideline, but the full implications must be understood and carefully weighed before doing so. "SHOULD NOT" or the phrase "NOT RECOMMENDED" mean that there may exist valid reasons in particular circumstances when acting contrary to the geuideline is acceptable or even useful, but the full implications should be understood and the case carefully weighed before doing so. "MAY or "OPTIONAL" mean that the guideline is truly optional; you can choose to follow it or not. When you add a new content, you will notice if a similar named tools exist. Please check if it is the same tool(s) you wanted to tag, if not, name it differently (example: Erosion (Icy) vs Erosion (MorpholibJ)). The purpose is to have a unique title for each entry. Whenever possible, try to add both the collection and an entry by component(s): e.g. MorpholibJ is an ImageJ plugin, and an entry by function (erosion in MorpholibJ, watershed in MorpholibJ etc.. are all components inside MorpholibJ). The purpose is then to help analysts to find the component they need when constructing a bioimage analysis workflow. Software with multiple implementations often require multiple entries. Example: SOAX - has 2 different ways of downloading it: One is the windows standalone executable and the second is the source code, which will require one to compile it in any OS. In that case, the best way is to create two entries: one by location of download since it is actually two different software, and each entry should have only one dowload page (has location). In addition one entry would only have Windows as the supported platform, while in the other, any OS. Collections also often require multiple entries. Example: Simple Neurite Tracer (existing entry) is an ImageJ-Fiji plugin which has three workflow options available: 2 semi-automated and 1 fully automated. In this case, one would create one entry for Simple Neurite Tracer (the plugin) as a Collection, then one entry by example workflow, and specify the difference in the title. You will have one plugin, and 3 workflows requiring the plugin Simple Neurite Tracer. tools with multiple interfaces (not described in bise-core-ontology) SHOULD be described by a single entry unless these interfaces provide fundamental functional differences. if in doubt, post in BIII.eu forum or contact confirmed taggers or admin. if you are the rightful owner of the entry (i.e. the tool developer or provider of an online service) and you are a confirmed tagger, change the field entry curator to your username. In case you are not a confirmed tagger, ask for modification of your user status in the BIII.eu in this page. if you are a normal user but wishes to suggest modifications to an existing entry, add a comment to the page of that entry and describe your suggestions. as a rule, a software entry in BIII.eu SHOULD describe the latest version available at the time of registration and SHOULD be updated, as required, for subsequent releases. Note that revision of your own entries is always available, so if you update to describe a specific version, please state so in the revision log. if a new version has fundamental functional differences it MAY be registered as an entirely new entry. In such cases, follow carefully the guidelines for entry name and version (see Name). Plan how to describe the entry functions (under construction). Read the general EDAM annotations guidelines (under construction). The guidelines below are organized into sections as they appear in the create software page in BIII.eu webtool. Canonical software name assigned by the tagger, preferably the software developer or service provider, e.g. "Fiji"
1. MUST use name in common use, e.g. in the tool homepage or publication. 2. MUST use short form if available e.g. MaMuT not MaMuT: A Fiji plugin for the annotation of massive, multi-view data. 6. SHOULD preserve original capitalisation e.g. MaMuT not mamut. collectionName is the name of library, main software in which the component is present natively or other collection the underlying tool is from (if applicable). Textual description of the software, e.g. "The neuTube is a collection of neuron reconstruction tools from fluorescence microscope images. It has an interactive system with a 3D viewer, which can be clicked in 3D and perform neuron tracing automatically and semi-automatically. It can automatically recognize branching points as junctions. Traced neurons can be exported to swc format, which could be imported by various software packages. neuTube has Win and Mac OS standalone executable builds and may also be installed by manual compilation." example 2: "All-path-pruning 2.0 (APP2) is neuron tracing (fully automated) component of Vaa3D. APP2 prunes an initial reconstruction tree of a neuron’s morphology using a long-segment-first hierarchical procedure instead of the original termini-first-search process in APP. APP2 computes the distance transform of all image voxels directly for a gray-scale image, without the need to binarize the image before invoking the conventional distance transform. APP2 uses a fast-marching algorithm to compute the initial reconstruction trees without pre-computing a large graph. This method allows to trace large images. This method can be used with default parameters or user-defined parameters." 1. MUST provide a concise summary of purpose / function of the tool. we RECOMMEND the description bo te of 1-2 short paragraphs. One or more strings that identify the author(s) of the tool. 1. Each author item MUST correspond to a single individual. In case an individual is not known to be the author, the name of an institution is RECOMMENDED. 2. Each author item MUST follow the following pattern: LastName, FirstName, where LastName MUST NOT be abbreviated and FirstName SHOULD NOT be abbreviated (usually when the first name is long it is RECOMMENDED to use full FirstName abbreviations or partial abbreviations (e.g. SCHOLZ, LEANDRO A. (orcid.org/0000-0002-2411-0429)). 3. SHOULD (if available) include the author's ORCID ID with the following template: LastName, FirstName (orcid.org/xxxx-xxxx-xxxx-xxxx) so they can be contacted more easily (to get the Orcid , google orcid + author name to get it. orcid.org/xxxx-xxxx-xxxx-xxxx). An illustrative image that represents the main functionality of the software entry. 1. It SHOULD represent the main software functionality or a screenshot of the UI in use. In cases where a single image cannot show the main functionality of the software entry (usually happens for general purpose software and libraries) the illustrative image SHOULD be the logo. The software entry will not be promoted on the front page without an illustrative image. There are only 4 discrete values for this attribute: Commercial, Free and open source, Free but not open source and I do not know. - Commercial is used when the software needs to be purchased in order to be used. - Free and open source is selected when the source code is available and the software does not need to be purchased in order to be used. - Free but not open source is used when the source code is not available (closed source) but the software is free to be used. - I do not know is used when the License/Openness is not know. This value SHOULD be avoided. 1. If an entry is a Shareware software with different License/Openness values (e.g. a commercial and a free version with fewer features), it SHOULD have both values selected. However, we discourage users to add entries of such type. Homepage of the software, from which is possible to download the software or some URL that best serves this purpose, e.g. "http://icy.bioimageanalysis.org/"
1. MUST resolve to a web page from the developer / provider that most specifically provides a downloadable version of the software or has a link to its source code. 3. The link to a Download page that does not work anymore SHOULD be removed and replaced by a new, working link. TIP: In case a tool lacks its own website, a URL of its code repository is OK. Do not use a general URL such as an institutional homepage. An url that links to a reference publication that presents the tool. 1. MUST resolve to a web page of a journal article or web page of a preprint server that most specifically links to a reference publication. 2. SHOULD preferably be a DOI link in the form https://doi.org/+DOI (e.g. https://doi.org/10.1371/journal.pbio.1002128). Normal URL links to the reference publication are OK but discouraged. 3. SHOULD preferably resolve to a publication where the tool was first introduced. 4. MAY receive more than one Reference Publication (use Add another item button). 5. The link to the reference publication that does not work anymore SHOULD be removed and replaced by a new, working link. An URL that links to a source of information about the use, installation and applications of the software. Accepts more than one documentation attribute entry. 1. MUST resolve to a web page from which one can obtain information about how to use the software. For example, a link to a user’s manual (e.g. Neural Circuit Tracer main page, or the the link to the User guide itself), a wiki page (e.g. Anamorf Wiki, or other link from which similar information can be obtained (example, Using Fiji page or a readme page with detailed information about the software). 2. From all the options above, it is RECOMMENDED that, if only one Documentation attribute is given, the URL to the documentation resolves to the most used and comprehensive source of information about the software, no matter its type (wiki, pdf file, web page linking to other pages, etc..). 3. MAY receive more than one Documentation link (use Add another item button). 4. The link to a documentation page that does not work anymore SHOULD be removed and replaced by a new, working link. An URL that links to a usage example, sch as a case study document (pdf, web page, video or other types of media), training material (also of any type of media, but preferably existing in BIII.eu), a workflow in which the tool is used (for components). 1. MAY link to an existing node in BIII.eu database (e.g. a workflow, a training material, a dataset). 2. MAY receive more than one usage example link (use Add another item button). 3. The link to a usage example that does not work anymore SHOULD be removed and replaced by a new, working link. An URL that links to a document, preferably in written media (pdf, slide deck), showing a comparison of the tool against other similar tools that perform the same job or very similar job. Examples: link to a research paper that benchmarks several tools, link to the web page of a Challenge in which the tool is included, reference to other web pages were the comparison is available. BIAFLOWS, the benchmarking webtool from Neubias WG5 could be a source of such attribute. However, we are still discussing how to interact with it. 1. MUST resolve to a web page that shows results of a comparison of the tool against other similar tools. 2. It is RECOMMENDED that the description (Link text) of the URL indicates the part of the document (a figure, a page or a reference in that document) where the results of the comparison are. 3. MAY link to an existing node in BIII.eu database (e.g. a training material). 4. MAY receive more than one comparison link (use Add another item button). 5. The link to a comparison that does not work anymore SHOULD be removed and replaced by a new, working link. A single DOI link to the software, related to the correct version of the tool described in the entry. There are many options out there (see this blog post from Datacite), but the most commonly used is Zenodo. 1. MUST be a DOI link in the form https://doi.org/+DOI (e.g. https://doi.org/10.5281/zenodo.30769 ). A link to an existing training material node in the BIII.eu database. 1. MUST link to an existing training material node in BIII.eu database (e.g http://biii.eu/node/1366). 2. MAY receive more than one training material link (use Add another item button). The following entry attributes (Has function, Has Topic, Has biological terms) may be considered the most important in BIII.eu. It is with them that the database will be able to connect the tools and make them searchable by bioimage analysts, developers and biologists. Details of a function the tool provides, expressed in concepts from the EDAM-Bioimaging Operation ontology, e.g. image classification and model-based segmentation. 1. MUST correctly specify operations performed by the tool, or (if version indicated), those specific version(s) of the tool. 2. MAY receive more than one Function, especially when the tool has multiple modes of operation. 3. SHOULD describe all the primary operations and SHOULD NOT describe secondary or minor operations. In case there are any questions, start discussion in BIII.eu forum. General scientific domain the tool serves or other general category (EDAM Bioimaging Topic), e.g. Tissue image analysis, Microscopy, Machine Learning. 1. MUST specifiy the MOST IMPORTANT and relevant scientific topics, although we RECOMMEND to refer at least to the single most important scientific topic. 2. MUST correctly specify Topics the tool relates to, or (if version indicated), those specific version(s) of the tool. 4. SHOULD NOT exhaustively specify all the topics of secondary relevance. Include Topic(s) that include the tool into the pool related tools (with the same Topic). And, if applicable, include one or more Topics that distinguish the tool from the others in the pool. (see discussion in EDAM-Bioimaging. 1. MUST specify the most important and relevant biological terms. 2. MAY receive more than one biological term (use Add another item button). A string in which the user may add keywords to the entry in case she/he did not find existing keywords in EDAM-Bioimaging functions or topics. This field is important to support further improvements and discussions on new versions of EDAM-Bioimaging or modifications in BIII.eu. 1. MUST be a concise keyword and comprise of the most commonly used keyword that relates to the intended theme/subject (to the best of the user's knowledge, for we do not expect the user to know the best term, which is also not always agreed upon by the scientific community). 2. MAY receive more than one keyword (use Add another item button). A link to an existing software node in BIII.eu to show in which platform it can be run or the dependencies of the tool. For example tool 3D intensity profile requires ImageJ to be run. On the other hand, DeconvolutionLab2 ImageJ plugin, not only requires ImageJ but also other libraries, such as (under construction). A discrete attribue that defines in which main execution platforms the tool can be used. There are only 4 values for this attribute: Linux, Mac, Windows, Unsure. 1. Component is an implementation of an image or data analysis/processing algorithm that may be used as a part of an image analysis workflow. A component alone does not solve a Bioimage Analysis problem. 2. Workflow is a set of components assembled in some specific order to process bioimages and estimate some numerical parameters relevant to the biological system under study. Workflows take image data as input and output either processed images or other type of data (usually numeric values). Workflows can be a combination of components from the same or different software. 3. Collection is a software comprising a group of Components or Workflows. Collectios are often image analysis platforms or libraries, e.g. scikit-image library and ImageJ platform. 4. I do not know is a tool whos type is unknown. Ideally, the user adding the entry SHOULD identify the tool type prior to adding it to BIII.eu. Software or data usage license, e.g. "GPL-3.0"
2. SHOULD use "Proprietary" in cases where the software is under license whereby it can be obtained from the provider (e.g. for money), and then owned, i.e. definitely not an open-source or free software license. 3. SHOULD use "Unlicensed" for software which is not licensed and is not "Proprietary". 4. SHOULD either use "Other" or the License name (if known) if the software is available under an uncommon license not listed below and which is not "Proprietary". Comprises both programming language used for the implementation of the entry and the programming languages supported by the entry. We still do not have a controlled vocabulary, so if you type a new language, which was not previously added in BIII.eu, it will create a new node with that name. A link to an existing software node in BIII.eu for which the tool was not originally developed, but that can be called from. A discrete attribute value that defines with which image dimensions the tool can be used. The four discrete values are 2D, 3D, Multi-channel and time-series. OBSERVATION: Some may understand there is an overlap with these values, for a 2D RGB image would also be a Multi-channel image and a 3D image could be a 2D + time-series image, etc. 1. Automated a tool that returns the output with a single command call (selection in a GUI) that may oy may not accept definition of parameters. 2.Manual a tool constructed in a way such that it uses a user interface, most commonly a Graphic User Interface (GUI) to help users perform manual image analysis tasks. ImageJ multi-point tool. 4.I do not know a tool that does not have a known interaction level. Ideally, the tagger adding the entry to BIII.eu SHOULD identify the interaction level prior to adding the entry. Comments are a valuable part of BIII.eu. The comments allow users to talk more specifically about a certain tool beyond the forum. Users may leave comments in each page of BIII.eu entries. The content of the comments may include an opinion about the tool perfomance (how good the tool does what was said to do), use cases or an update on the current status of the tool (deprecated, legacy, etc..). Users MUST be polite and avoid rude, violent comments.